The recurring theme this week seems to be about stories of where we come from and sometimes going back to our roots to start over again. Two very special places struck a cord with me, Agness, OR and Warm Springs, OR. After several weeks of riding Highway 1, I was getting tired of constant fog and winds so after Gold Beach, OR, I decided to turn inland and ride the Bear Camp Coastal Route. Right before you begin the fifty miles of twisty and winding road with 15-25 mph curves is a town with a very small population called Agness. Agness is an unincorporated town that is located two major river in Oregon, Rogue and Illinois river. The Post Office was established in 1897 and the town was named after the Postmaster’s daughter. 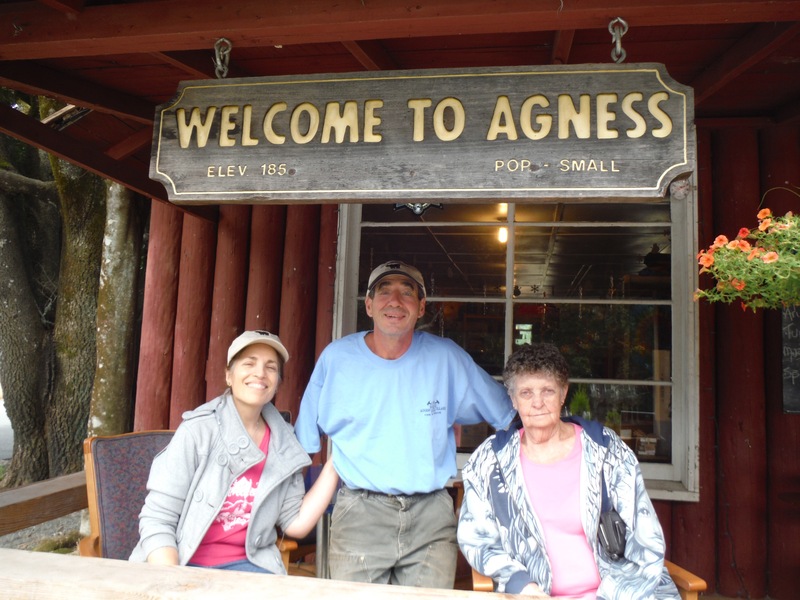 Agness is only one of two town that is served by rural mail boat still operating in the U.S. The area is a popular for fishing and the river tours. 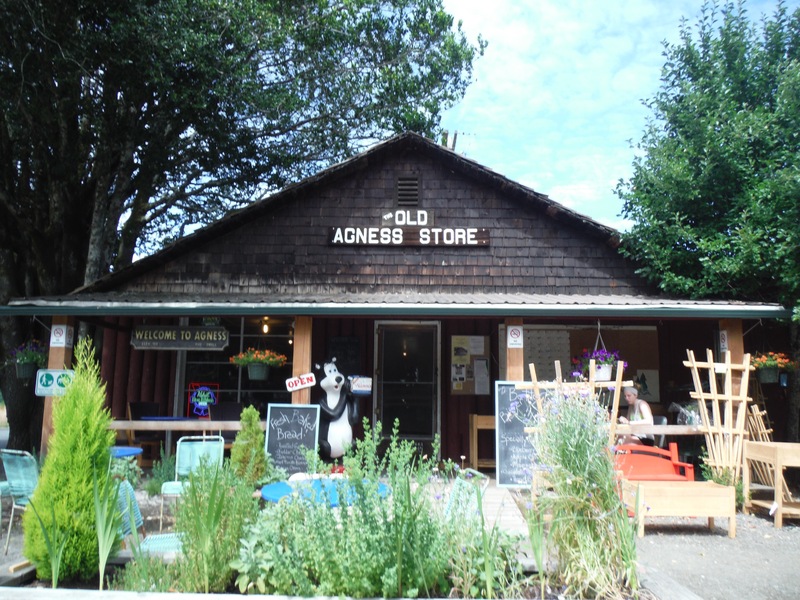 I stopped at the Old Agness Store in Agness, Oregon to take a break and to try some Apple Fritters. The Apple Fritters were delicious and sorry Allison, I couldn’t get the secret family recipe. As I was sitting there, an older lady (Rebecca Sims-Grant) walked in with her daughter, granddaughters and great-granddaughter. I couldn’t help but overhearing their conversation inquiring about certain resident still living there. So I asked her, if she lived in the town and she said that she used to back in the early 50’s. Then she proceeded to tell stories of living in the town during those times. It was also her daddy and uncle who built and owned the General Store. The store was the gathering place for the local news and gossips as she put it. The one room school house still exist to serve the local kids. She remembered that there were only nine kids in the days she went to school there. I asked her what brought her back here and she wanted to show her family where she grew up and what it was like living in a small rural town. Rebecca was quite impression how the General Store looked now. This is due to new owners, Steve and Michele, who bought the place back in 2013. It took them four months of renovation in order to bring it back to life. Steve and Michele Berlant met back in 2008 when Steve was living in Agness and Michele, a resident of New York has been visiting her family here since she was five years old. She decided to move back to Agness and married Steve to begin a new life here with the general store. I wished I had more time to listen to their stories but they were quite busy cooking and attending to the stream of customers that kept walking in. 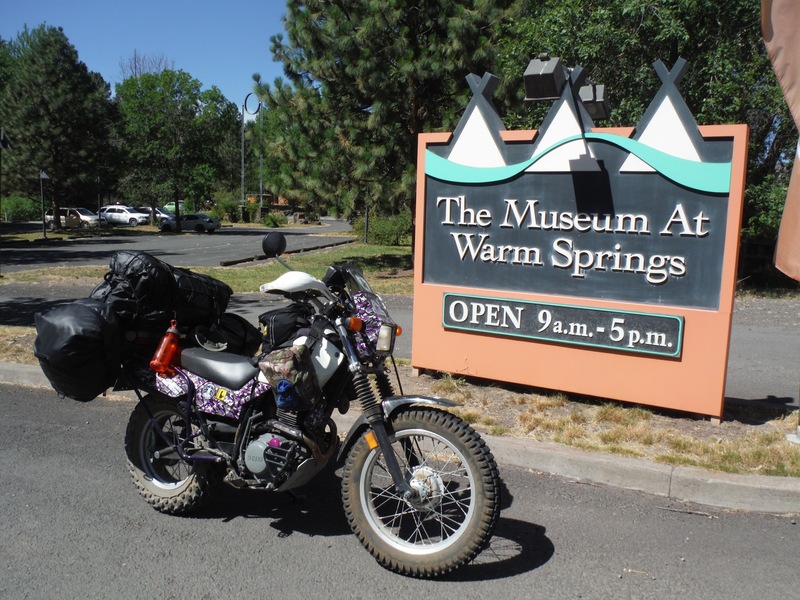 It was time for me to mosey on to the next stop on my journey which was Warm Springs, Oregon. As I was wondering up Highway 26 toward Mt. Hood, I noticed a little museum on the side of the highway and decided to check it out. It was called The Museum at Warm Springs which was about the Confederated Tribe of Warm Springs. It consist of three tribes; the Wasco, Tenino (Warm Springs) and Paiute. It was typical of any Native American museum but what caught my eye was the last line on an informational plaque about petroglyphs. The plaque was called “Songs of Our People” and it read as this: The stories of our people tell of our creation, evolution, and destiny. They live in ancient song and are written on the land around us. We must protect these stories, passing them along to future generations by sharing them in the present. The writing on the rocks and the ancient songs still speak to us. But will we listen? As I read that, I think about how many people who have had to move away from their hometown due to jobs, economy, weather or whatever reason it may be but never go back and revisit their root or pass on the stories of their childhood onto the next generation. As for me, I haven’t been back to my childhood home in very long time and hopefully soon I will get the chance. For now, I do not have any roots since the road is my home but at every stop I make, I get a postcard to send to my granddaughter so she can see where I have been and cherish the stories I have to tell on my journey. looks like you are wandering around properly, keep your knees in the breeze! Oh yeah, ride your own ride and follow your heart! Well, having lived in many places I often try to get back to them just to see the changes that are made and at times take one someone to share a little bit of my history. And while you are gone from the place I currently call home. I hope you know that you’re writing and stories are inspiring other people to really explore or re-examine their past (thank you for that). And as always, you are missed. Be safe on your journey, i’m sure that years from now people will be looking back and going really well that little crazy woman that came in to visit us, i’m sure that years from now people will be looking back and going really well that little crazy woman that came in to visit us and as such are adding to their history ….. Thank you Russ. I miss you guys too. I hope that I can be an inspiration to many people to go out and explore life.